Nancy and I both spent close to 30 years working for the engineering division of a defense contractor. In 1999 we decided it was time for a change. We sold our house and purchased the farm where we now live. We bought several female alpacas and started NEWAIM Farm. Over the next several years the herd grew and in 2004 I left my day job to run the farm full time. A year or so later we purchased fiber processing equipment and Nancy left her day job to run NEWAIM Fiber Mill. We rented space for the mill that first year while I put up a building here at the farm. We moved the mill here in the spring of 2006. In 2008 we sold the alpaca herd and I started a handy man business doing small projects around town. 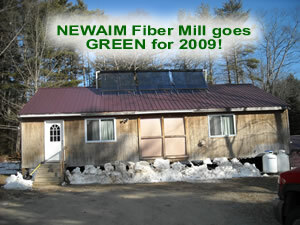 We also added solar hot water to the mill late in 2008. After a short time we realized that we missed having animals around. It just didn't seem right to have the pastures we had worked so hard to build set empty. Besides a fiber processing mill should have something fuzzy running around out front. We began searching the internet to see what was out there. We wanted something different, no sense raising what everyone else already has. We wanted a dual purpose animal so that we could fill our freezer as well as harvest the fiber. We discovered the CVM Romeldales and began doing some research. They produce a significant quantity fine wool. Several of our sheep shear 13 lbs of 20-24 micron wool. They grow fast and have a well muscled carcass. 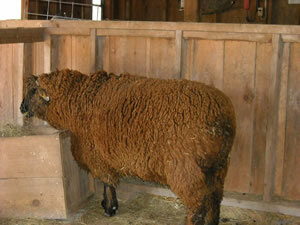 The first one we processed was a 3 year old ram who weighed around 275 lbs. The meat was tender and had a very good flavor. They also were rare, a critically endangered breed with only around 200 animals registered each year. This meant there was likely to be a strong market for quality breeding stock. We purchased our started herd in the spring of 2009 from Chris Spitzer of Yellow Creek Cottage in Ohio. Chris was very helpful in our start up and provided great after sales support. We hope to do the same for our customers. At the end of 2010 we have 11 ewes and 2 rams. We expect to have lambs for sale in 2011.